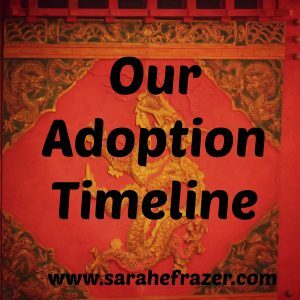 **The following letter was written by a fellow adoptive momma (not me). She is sitting across the table from me right now. Her little hands have just finished off the last of what was a mammoth portion of cereal and those tiny fingers are oh-so-adorably sticky and she says to me, “She wants a dru-ee-nk.” I’m off to fill up her pink and yellow sippy cup with her favorite apple juice. The truth is I have no idea why you abandoned her. I cannot fathom it. The second truth is that she had a really hard beginning. 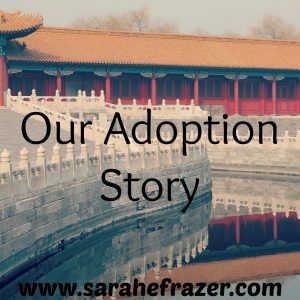 She wasn’t well loved and taken care of in her orphanage. She was in pain and starving and barely alive when I made it to her. It hurts my heart to know that she wasn’t protected well. But as her mother I know somehow you must grieve her loss. Perhaps you try not to think of her, perhaps you try to forget the trauma that was leaving her behind and walking away from your daughter. Maybe you honor her memory with a flower or present each year on her birthday. You are privileged to know what day that is. I honor your secret memory of her birth and hope you cherish the memory well. Here is the third truth. She is loved. She is cherished and adored. She fought so hard to stay alive and she won. Rest now, because she is finally safe. Her skin is fair and her dark hair is filling out and growing into a fuzzy patch of fluff. She has a dimple on each side of her face when she tries not to smile. Her nose is a perfect button nose. She has no eyes, but you already knew that. The birth mark on her face looks a little like Italy and it gets kissed every single day. Her mouth is always moving. She is such a talker! I don’t know you, but I do. You echo through to me every single day. I hear you in her giggle and know that you probably have the most adorable voice and that you must sing, because she goes through life in song. You must be tiny and I wonder what birth was like for you. Do you have dimples too? Is your face perfectly petite? I hope that the loss of your daughter hasn’t stolen your smile. In her honor, please, hold on to the fun and beauty of life. Smile for her today. She would wish it for you. We speak of you often, and in that way you are a part of our life, our family and her life. I don’t know what happened, or your reasons for not raising our daughter. I know life is unpredictable and tragedy strikes when we least expect it. I often pray for wisdom on how to honor you as well as the truth in our home. It is a delicate balance. But know this, in our home we teach Christ and His forgiveness and love. This story requires all three of those things. I want you to know that I adore our daughter. She is such a joy and light in our home. At the same time I grieve that you do not have this honor, this privilege. It should be yours, and yet through tragedy and grace it has fallen to me. I will hold it well. Thanks for reading! Please follow! 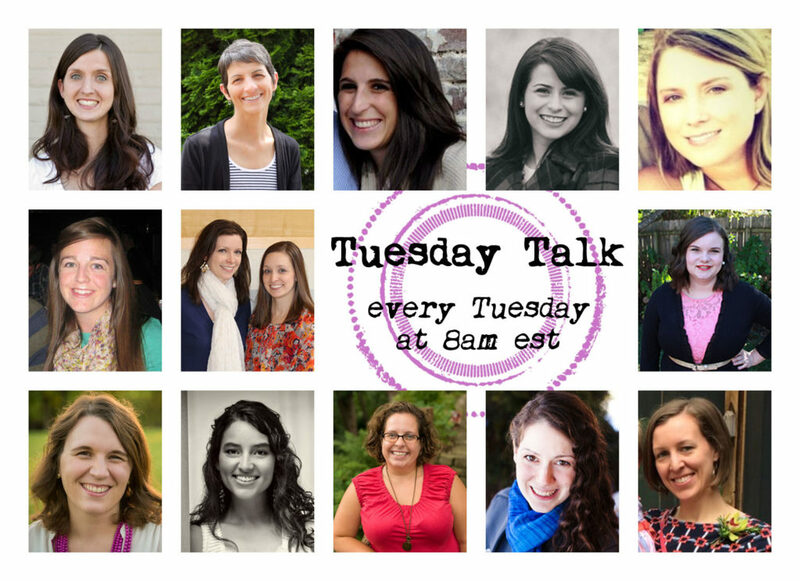 Please join me on Tuesdays for TUESDAY TALK! Link up your favorite post! I know exactly how you feel. Beautifully written. Thanks for joining the linkup! What a beautifully written post. We have many friends in our circle who have adopted. You have written their story too. Thanks for your transparency. Thank you for those sweet words Jennifer. You are such a wonderful encourager! 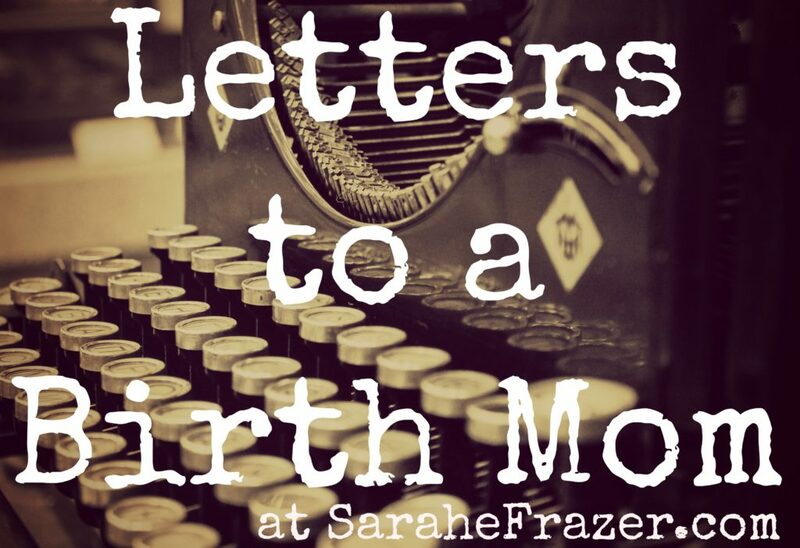 Beautiful blog Sarah. I’m sure it has to be a mixture of emotions you feel. But God placed her with you for a reason. Because of you, her life will be much different. Hers is a completely different path now. A great picture of what God did in us isn’t it? Wow, so many emotions. It’s really hard to go through and think of the myriad of emotions that a birth mother must be going through. I can’t even imagine the pain of feeling you had to leave your child at an orphanage and then never knowing what became of them. Her daughter is so very well loved, I hope somehow the birth mother can feel that. Thank you for sharing a piece of your heart! Beautiful! I hear your heart of love. One of my college roommates is a single gal and desperately wanted a little girl. She adopted a darling one. Such a blessing for these ones whom God places on a loving, Christian home. It’s neat to think of the plans God may have for them. Who they will reach for the kingdom! Blessings to you!!! Thank you so much Dainne….Katie did a wonderful job sharing her heart. 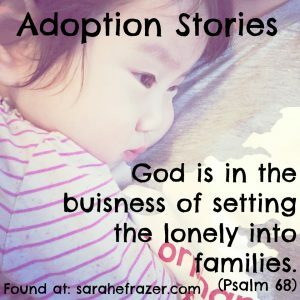 I love to hear how God sets the lonely in families – what a wonderful gift of a family your friend gave to that child! Thanks for reading!